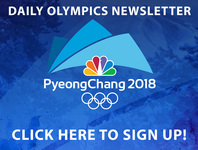 Watch as former Olympian Julia Mancuso gears up for her first Olympics as a spectator at the Winter Olympics Superstore in PyeongChang. The four time Olympic medalist got an inside look at the Olympics Superstore before it opened. Inside she played some virtual games and picked out some clothes with the mascot on them, so she could have the full spectator experience.